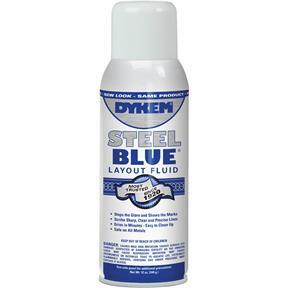 Steel Blue Aerosol, 16 oz. 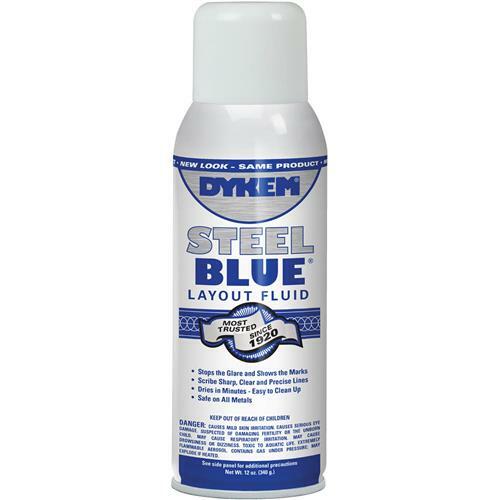 ITW Dykem/Dynam 80000 - Steel Blue Aerosol, 16 oz. Just order by 10:00AM PST on Mon. and choose expedited shipping during checkout. Due to DOT shipping restrictions this item cannot ship via air services, or to addresses outside the Continental United States. Machine shop operators depend on Dykem? Steel Blue Layout Fluids to scribe sharp, clear, precise lines. When applied, our layout fluids provide a uniform deep blue color that prevents glare and dries in minutes. All Dykem? Layout Fluids create an extremely thin film which adds practically no thickness to the work piece and remains flexible without cracking and chipping. This layout fluid is toluene free and dries in minutes. Aerosol can, 16 oz.